Patients with inflammatory bowel diseases (ulcerative colitis and Crohn’s disease) have a greater risk of developing colorectal cancer (CRC) as compared to patients without colitis, requiring increased surveillance colonoscopy. Chronic colitis may progress to dysplasia and in turn dysplastic lesions carry a high risk of progression to adenocarcinoma. 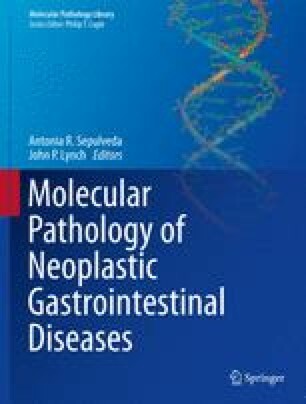 Although many molecular players are common with sporadic colorectal carcinogenesis, since IBD-associated dysplasia and cancers are initiated in a specific inflammatory milieu, these lesions are significantly different at the molecular level. This chapter will review the most recent advances in molecular alterations observed in IBD-associated neoplastic lesions. Importantly, in view of these differences, approaches used for early detection and specific targeted therapies may differ between IBD-associated and sporadic forms of CRC and pre-cancer lesions.